United Review Services sets the standard for excellence in clinically-based hospital and provider bill auditing. Our audits go far beyond the scope of re-pricing / unbundling software programs, achieving audit results which are medically valid and defensible. Our proprietary auditing procedures detect and address all areas of potential errors, including coding errors, unbundling, code upgrading, fee schedule non-compliance, R&C excessive billing, and fraud. 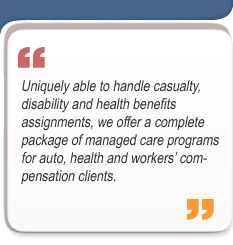 Specialized RNs perform all audits and directly oversee the fee schedule auditing programs. In addition to accessing the latest technology and resources for fee-schedules and coding principles, our RNs apply extensive CPT and ICD-9-CM experience and a high level of clinical expertise to each audit, insuring a more accurate medical and financial outcome than would be available with auditing software alone. To prevent balance billing or disputes with the client or insured, we also finalize each audit with the provider after reaching full agreement on the medical or coding issues applicable to the bill, as well as the amount to be paid. We average a return of over $10.00 in reductions due to improper or inaccurate billing for every $1.00 spent by clients on our auditing services.